We decided to move to New England Bay the following day. There is a large picnic area here right next to the beach and we had seen people wild camping in tents as well as campervans on the previous day’s bike ride. I did have a concern with using this as an overnight spot because it is right at the entrance to a campsite, in fact you drive through the picnic spot to get to the campsite. One of our guidelines for choosing an overnight wild camping spot is not to park in direct line of sight of a campsite, this avoids bad feeling from campsite owners who might feel they are missing out on trade and can often be the driving force behind a lot of the unenforceable but off-putting ‘No Overnight Camping’ signs. We agreed that we would go out fishing and then decide what to do. In the end we decided to stay at the campsite because we still had a lot of the day left, it was pleasant weather and we could do our laundry and hang it out to dry. This was our first campsite for over a week and was a Caravan Club location. We are members of the Caravan Club but I’m not a fan, the main sites are pretty expensive and overly regimented. However it was in a lovely location and had all the facilities we needed. 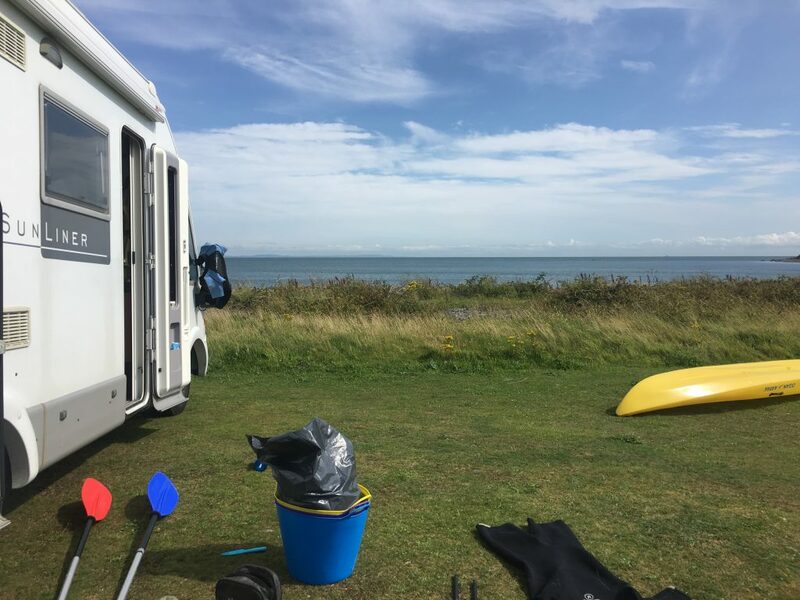 We kept the cost down by asking for a non electric pitch which came as a surprise to one of the wardens who asked us twice whether that was really what we wanted – they only have a couple such pitches and didn’t seem to believe that we could cope without it. We launched the kayak from the shallow sloping shingle beach in front of the picnic area and paddled out into the bay, trying to gauge how the wind and current would move us. Ideally we would paddle out and then fish as we drift, which worked here with a few corrective paddles to stop us from floating out into the centre of the bay. We could see cormorants, gulls and gannets diving for fish, so we knew there must be something around. And there was, mackerel, lots of mackerel. Luckily mackerel is our favourite eating fish, but we couldn’t get through the mackerel to catch anything else. We decided to limit our catch to 6 large mackerel, but we must have caught and released 50 or more small mackerel in our efforts to catch something else. There were plenty of other fishing boats, including some kayaks, in the bay and I wondered if they were having the same problem. A bass would have been nice for a bit of a change. Most sport angling boats in the Bay of Luce go out tope fishing but I don’t have any interest in tope a) you can’t eat it, because they have to be released, and b) they are too big. I have seen pictures of kayak fishermen who have caught tope and wrestled them onto their kayak for the trophy photo. I entertained myself by wondering what I would do if I inadvertently ended up with a tope on my line. I decided that I would probably panic and then capsize, or possibly be dragged out to sea never to be seen again. 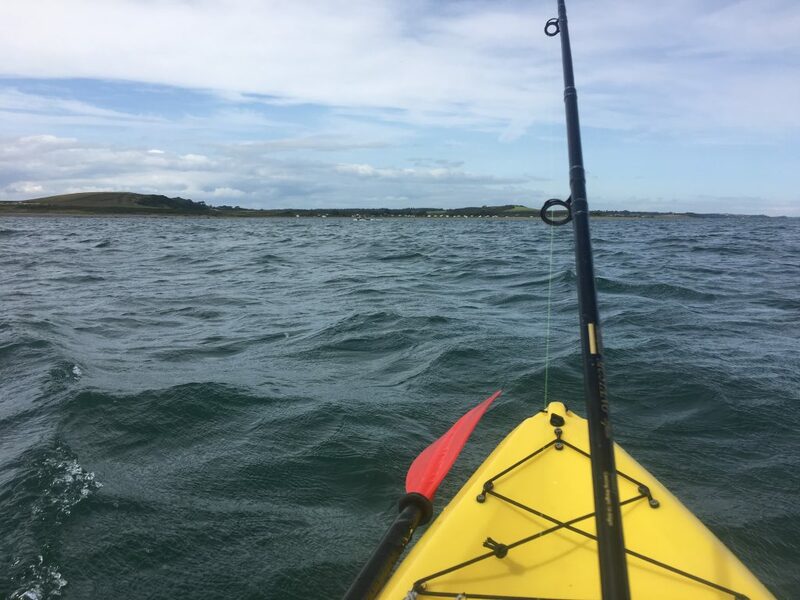 After a couple of hours or so of catching mackerel the wind started whipping up white horses on the water and my legs were starting to goose pimple so we called it a day and paddled back in, feeling happy that we had managed to catch something after our (Paul’s) disappointing record so far. I cooked up all of the mackerel that evening, simply wrapped in foil with butter and lemon. What we couldn’t eat that day went into our rolls for lunch the next day. Full of Mackerel and with our laundry clean and blown perfectly dry by sea breezes we were two happy people.